The current trail planning focus for the Pennsylvania Highlands Trail Network (PHTN) project is to close gaps along the conceptual PHTN route between the Delaware River (D&L Trail) and the Perkiomen Trail. As of January 2019, two feasibility studies and a Trail Concept Plan have been completed for this easternmost region of the Pennsylvania Highlands covering portions of Bucks, Montgomery, Lehigh, and Northampton Counties. Two more trail feasiblity studies are nearing completion, one for the Tollgate Landing Trail Gap and one for the PHTN in the Musser Scout Reserevation. A Trail Concept Plan has been completed and identifies alternative trail routes in the Unami Hills area between Finland (near the border of Bucks and Montgomery Counties; Milford and Marlborough Townships) and the Perkiomen Trail near Green Lane. The Upper Bucks Rail Trail is in the engineering phase. This rail trail will connect to the Saucon Rail Trail at the Lehigh County line in Coopersburg and travel through Richland and Springfield Townships, Bucks County. This 3.0 mile shared use trail should be constructed by the end of 2019. A portion of new trail (1.5 miles) is under development between the D&L Trail in Bridgeton Township and Ringing Rocks County Park. The Appalachian Mountain Club Professional Trail Crew has cleared a 1.3 mile wooded section of the future Ringing Rocks Trail. Much of the trail will follow the footprint of a historic logging trail. A new parking area has been developed by Bucks County on the northeast side of River Road. AMC will partner with the County to develop directional signage and an interpretive kiosk in this area. A new trailhead on the north side of River Road in Bridgeton Township opened in 2019. 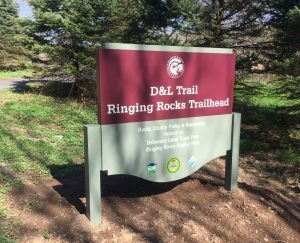 This trailhead will provide access to the D&L Trail, Delaware Canal State Park and Ringing Rocks County Park. In the summer of 2019, Quakertown installed PHTN directional signage along the route through the Borough.